Trillium (Trillium spp.) is a family of perennial wildflowers of Asia and North America that has as many as 30 species. Trillium gets its name because it has three leaves, three sepals and three petals. A favorite among wildflower enthusiasts, trillium inspires springtime jaunts to quiet woodlands where its blooms can be enjoyed in its home environment. In the United States, trillium grows in the Eastern woodlands and the mountains of the Pacific Northwest. In keeping with their native environment, gardeners in United States Department of Agriculture plant hardiness zones 4 through 9 should provide trillium with shade and rich, organic soil. Among the colors of trillium are delicate white, blossom pink and deep shades of reddish purple. The flowers are followed by berries that vary in color from red to brown to purple. Some kinds of trillium bloom in early spring, giving the plant the nickname "wake-robin," so named because they show up even before robins return from their winter haunts. The largest of the trillium species is the great white trillium (Trillium grandiflora), which can grow as tall as 15 inches. It can be planted in gardens in USDA zones 4 through 7. 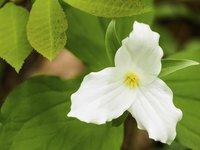 Many trillium species are protected, so don't pick them in the wild. Always purchase plants from a reputable garden center. Native Americans used the roots of trillium for medicinal purposes or cooked and ate the greens. They are also a favorite among deer, who sometimes eat enough to make the plant scarce.